Sometimes the best trips are the ones done in the spur of the moment, with adrenaline, excitement, and a tremor of impatience dancing through your mind. It’s a heady mix that has you rushing from one website to another, calling up friends and getting them to share in your enthusiasm, until you have a car full of friends and family and you’re on your way. That was how I made it to Athens on a Labor Day long weekend–which in Romania happens in spring, with May 1st being the actual holiday. Traditionally, it’s a holiday spent somewhere at the seaside. Or that was the most popular way of spending it when I was in high school. I wasn’t allowed to go, as the idea of a few nights of drinking and parties on the seashore didn’t make my mom feel very confident in my safe return home. Ironically, my mom was there when I first experienced a beach on Labor Day weekend, and it wasn’t what either of us had imagined. How we ended up going all the way to Greece? I just had a hunch and did a few searches. It helps to try out different destinations when you decide on a trip a couple of days before your departure. 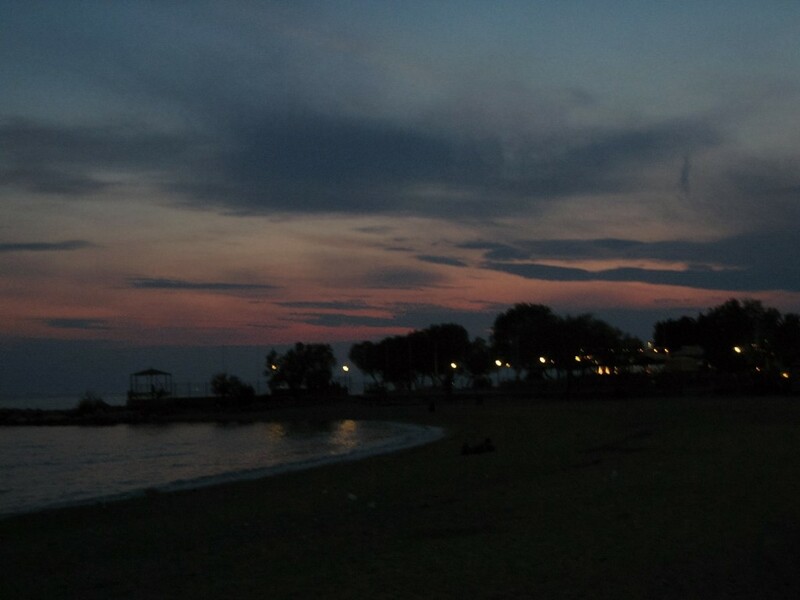 It turned out it was cheaper to spend two nights in Athens than on the Romanian seaside. Not a big surprise as the entire country flocks to the Black Sea on Labor Day and it’s the one time when hotels in the area can make money off season. We estimated gas, food, and visiting expense as accurately as we could, and it was still cheaper. Also, a lot more enticing than the same old Black Sea resorts which we’d all visited numerous times. My mom, my roommate, and my boyfriend at the time all went with me. I knew Mom had wanted to go as much as me, as we’d shared a passion for Ancient Greece and their gods and myths. 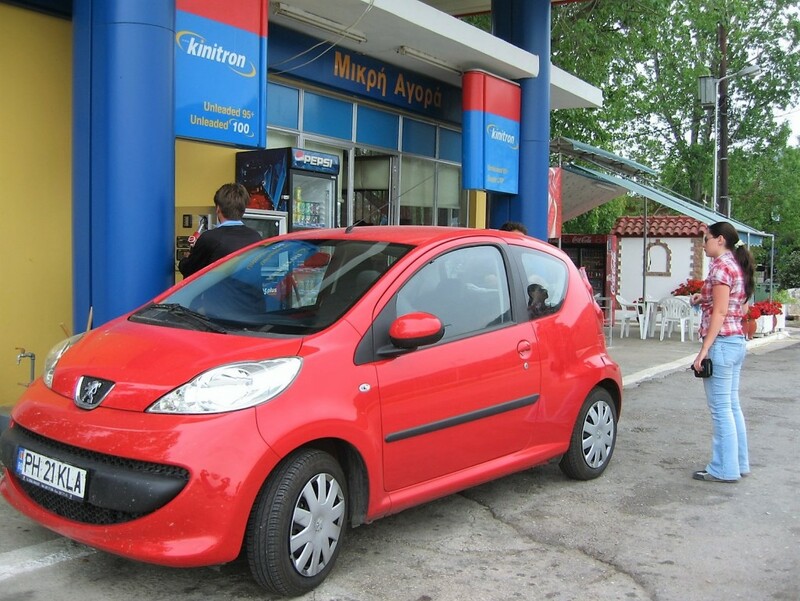 So we packed the car and ourselves–yes, four people and luggage in my tiny Peugeot 107–and drove from Bucharest, through Bulgaria, via Sofia, all the way to Athens. As it happens when you’re the only driver and tired AF, there were roadworks all the way from the Greek border to Athens. It was tons of fun! And about twenty hour long. Fun fact, GPS was still relatively new at this time. It was also expensive enough that I hadn’t gotten one yet. So we used plain old maps to get to Athens. 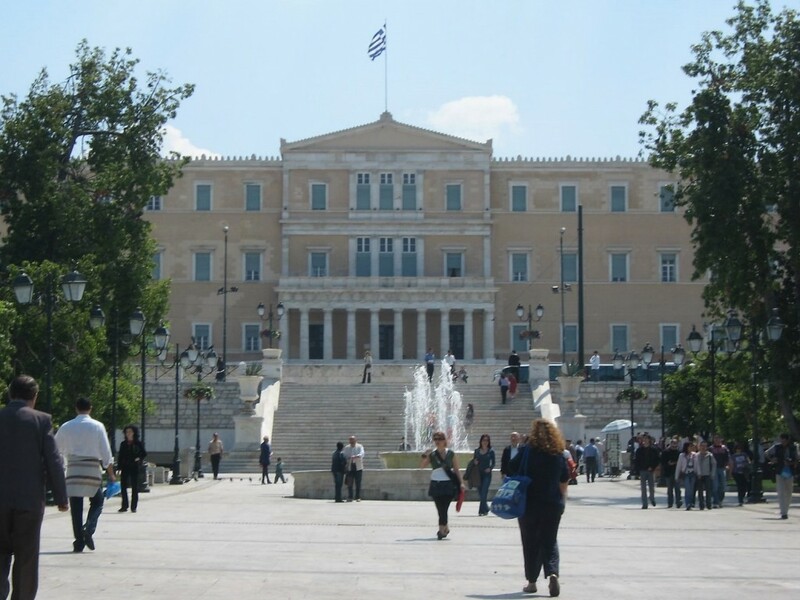 As you can imagine, it took a bit to find the hotel after getting to the Greek Capital. But we found it, eventually. When we finally got to the hotel, it looked as I would have expected. Cheap and comfortable. The best things about it were that it was low priced, it was three stops away from the city center, and they had these cool, soft sheets that are the best I’ve enjoyed to date. All that had to compensate for our next day discovery – it being cheap and in a business-like area meant the hotel was used (especially at lunch time) by lovers who would rent a room for a couple of hours. Yup, that was fun! And I am still denial about some of those women being professionals. We had an early start the next day (it was a Saturday), with a simple but tasty breakfast, and a bus ride into town. Silviana, my roommate, tried to ask for directions in the bus, which lead to a bit of a misunderstanding. It took me a few minutes to realize the nod I thought meant ‘yes’, was the sign for ‘no’, similar to that in Turkey or Bulgaria. We had a laugh, spotted the Old Royal Palace from the bus, and decided we had reached our destination. We started with an aimless walk around the city center, admiring buildings and gawking at absolutely everything. It was a hot day, way hotter than Romania had been when we’d left. I don’t usually wear glasses till summer hits, but the sun was so bright, the shades stayed on almost all the time. As we were making our way with no real direction down one street, I found something truly marvelous. An empty pedestal, just perfect for when they’ll erect my statue! 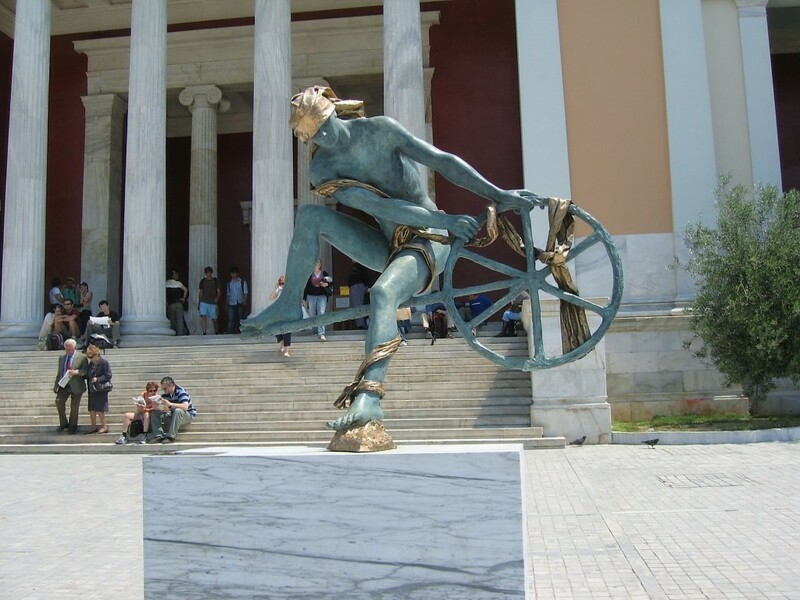 Not sure why I’d get a statue in Athens, but I found a spot for it just the same! 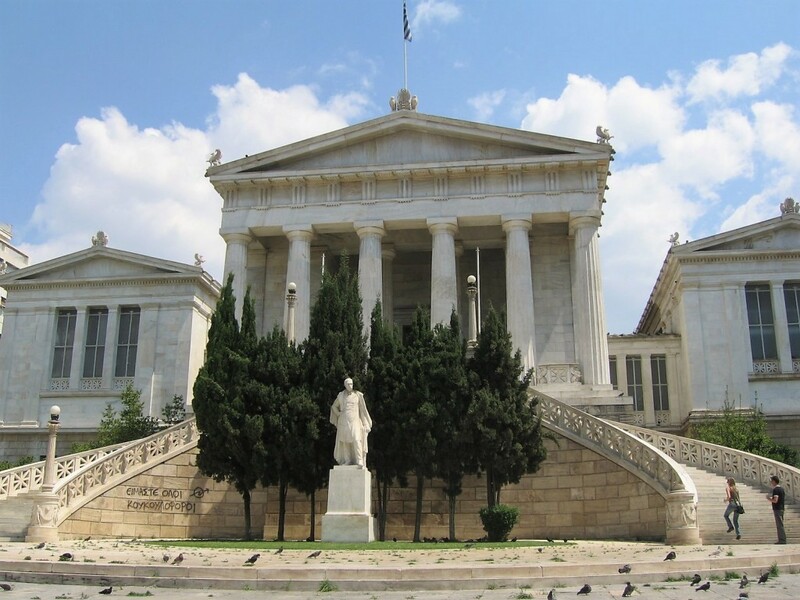 The next stop was the National Archaeological Museum which we just happened to stumble upon. We went in and there went a few hours of our lives! The art, from engravings to statues and jewelry is just too beautiful to ignore. 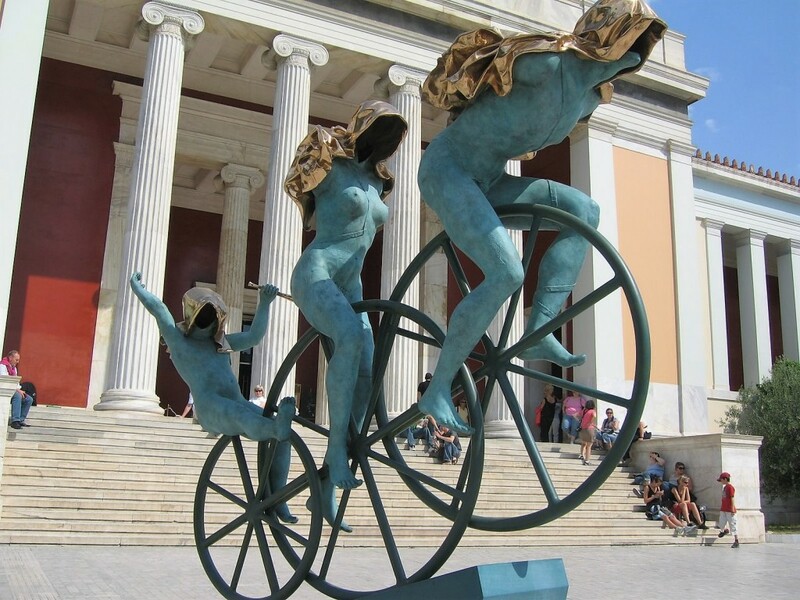 And for a taste of the modern arts, we were treated to the mesmerizing statues in front of the museum. What totally surprised me was the large number of young artists sitting everywhere on the floors of the museum, sketching old masterpieces. It looked so cool and for a moment, I wished I had the skills to join them. 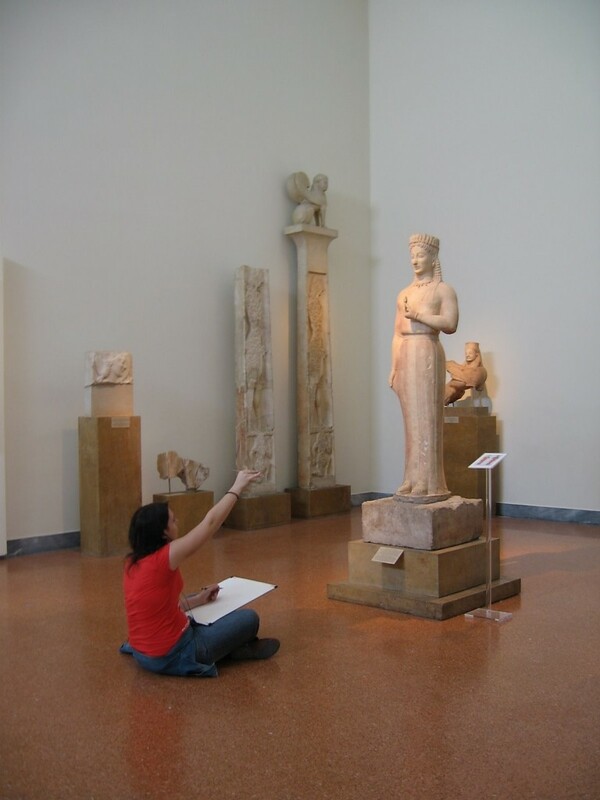 Alas, I had to comfort myself with looking at more urns, pots, sculptures, paintings, and everything else dug up from the many ancient sites within Athens and the entire Greece. Before we left, I had to take another moment and enjoy the statues outside. The art was a bit of an excuse, the truth was we needed to sit down for a while before walking some more. When we were sufficiently rested, we made our way back to where we had started. We had seen a pedestrian area filled with restaurants and we thought it would be a great place to enjoy lunch at a terrace outside. Which we did, after saying hi to a statue of Athena (who has always been my favorite goddess). Of course, more Mythos happened during lunch. After our lunch, we went ahead and explored the nearby temples. Zeus and Apollo’s once glorious temples are barely standing today. Yet walking by those tall, beautiful columns never fails to make you feel in awe. And super short! We returned to our hotel to change and had dinner somewhere nearby. We were knackered and had a big day to look forward to, so we went to bed pretty early. The second day started with great plans. 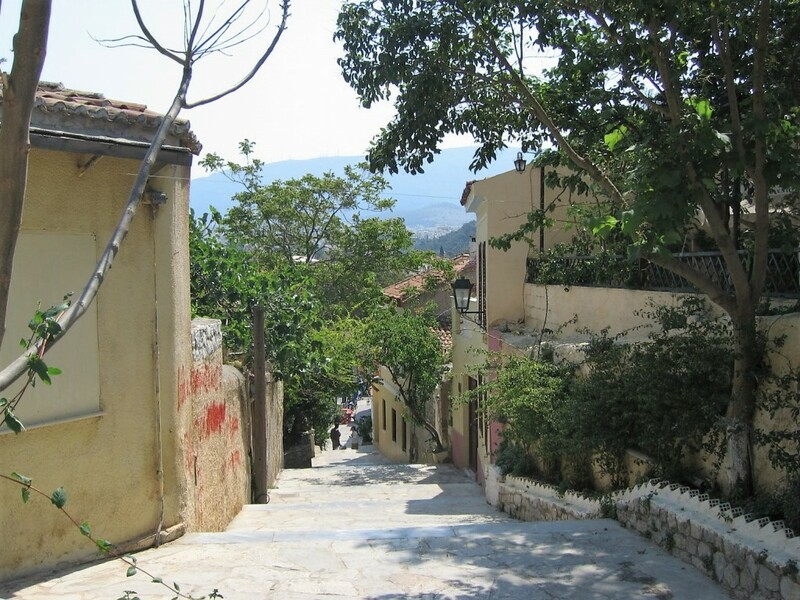 It was the day we were going to climb up to see the Acropolis! We took the same bus to the same stop, and then used some small tourist maps to find our way to Acropolis. 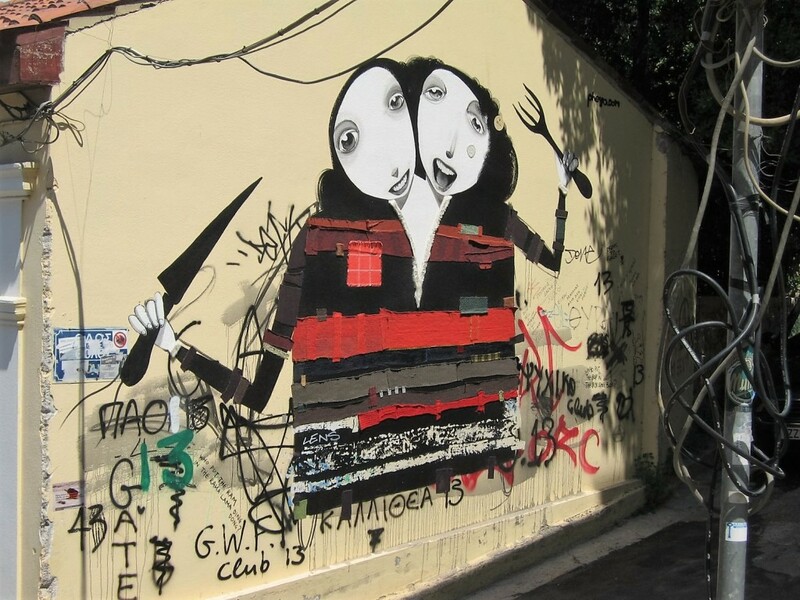 On our way there, we were treated to narrow, ascending streets, and gorgeous street art. Sadly, as we were walking by random olive trees and slowly making our way up, Mom said she’d wait for us there. 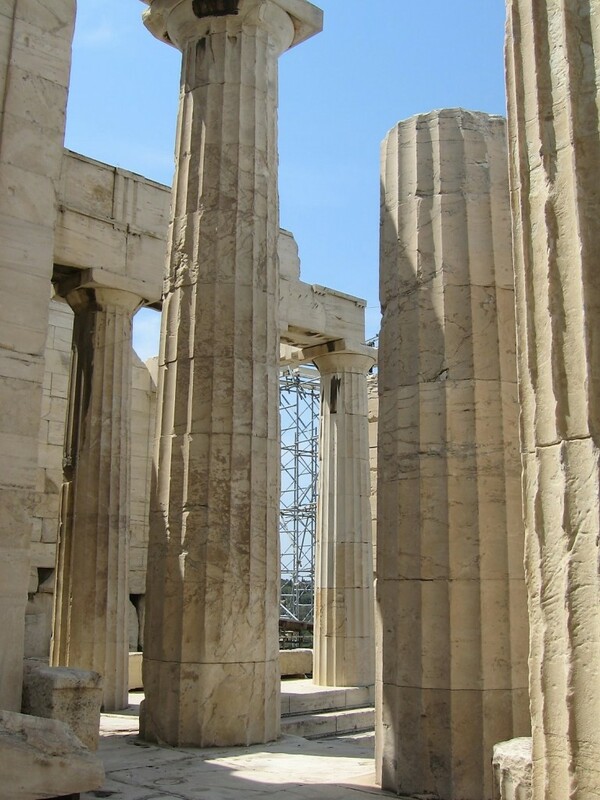 She managed a glimpse to the Parthenon, but the ascent was too difficult for her back issues. I felt bad about leaving her there, but she insisted. One of them had to make it up there! On our way up, we made our way past the Theatre of Dionysus, which really isn’t that impressive at first glance. That is until you think they used to have a thriving culture here while other parts of the world were barely able to clothe and feed themselves. 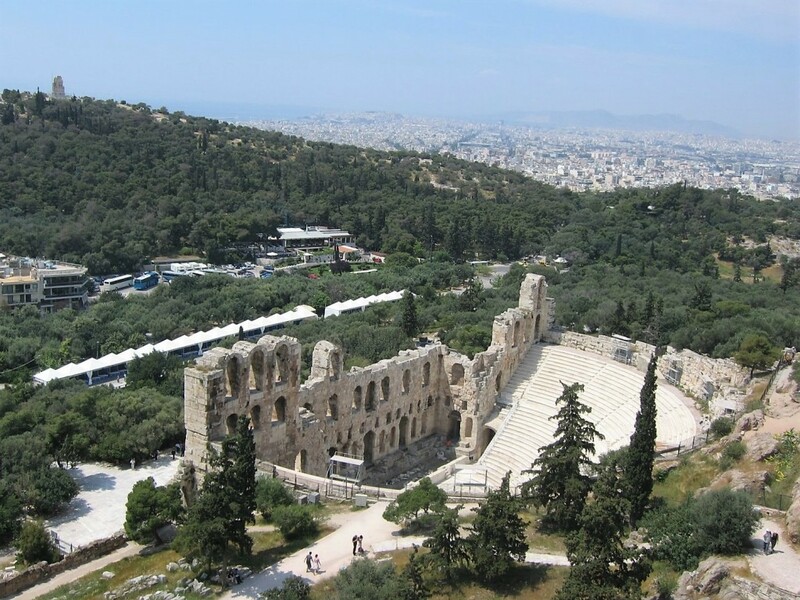 Close to the Theatre of Dionysus is one of my favorite sites from this ascent – the Herodeon or Odeon of Herodes Atticus. It’s a lot more well-preserved and it its position is so impressive and awe inspiring! It took us a good hour to climb all the way to the top. It might have been slightly more, or even less, but I couldn’t really tell. I was too busy admiring everything and occasionally picking my jaw off the ground. Yet nothing had prepared me for how delighted and dwarfed I’d feel once we made it all the way up. 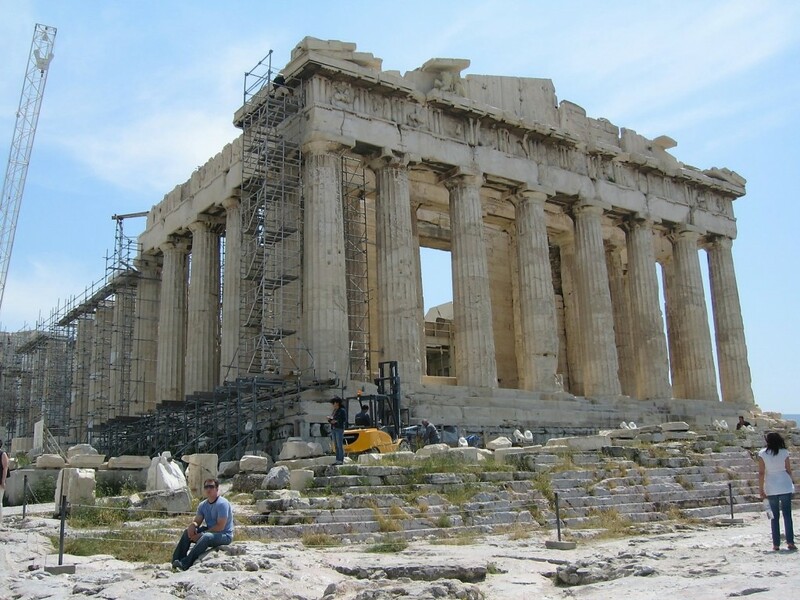 The Parthenon, the Caryatides at the Erechtheum, the Acropolis museum… I was in a permanent daze all the while. I honestly never wanted to leave, but we had to make our way back. We met my mom and showed her all the pictures we’d taken. We then walked back to the city center, trying to find a place where to eat. We got the obligatory olive oil to take home, along with some magnets and other trinkets. We got those from a small shop where the owner was collecting money from all the countries his customers came from. He had most Romanian bills, so we left some coins for them. After a much needed meal, and a slow walk through the park next to the Old Royal Palace, we took the tram to the beach. I had no idea what beach it was, I just saw there was one near a tram stop. 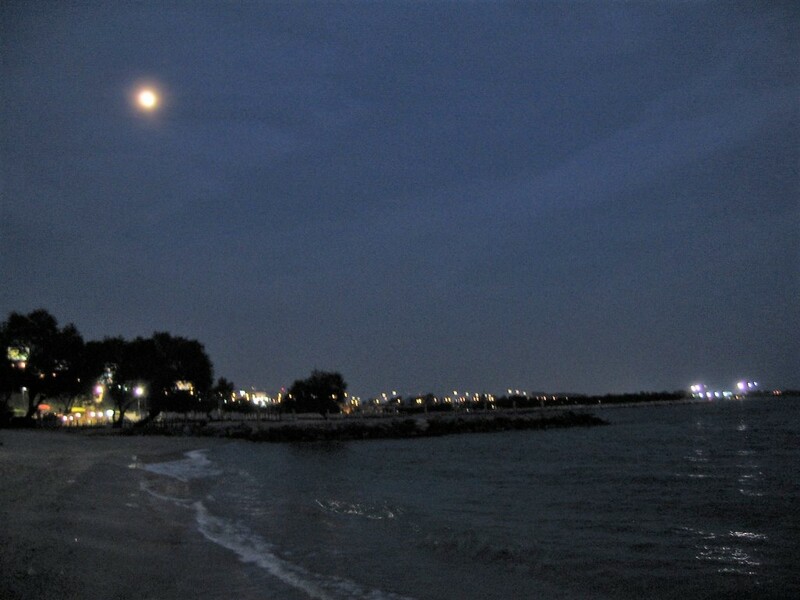 We enjoyed a lovely sunset and a bit of moonlight before heading back to the hotel. 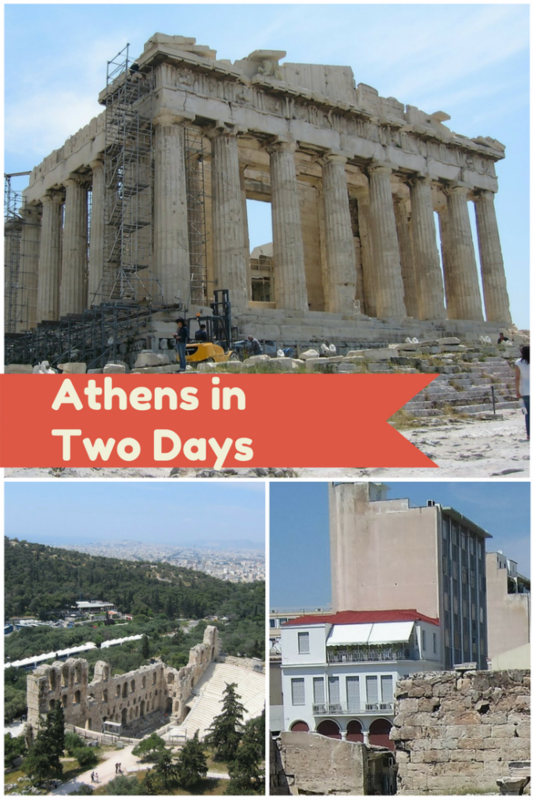 Leaving Athens – Harder Than You Think! Leaving Athens was a nightmare. And almost impossible! And while I was sad to go, that wasn’t what made it hard. See, we’d enjoyed Friday evening through Sunday in Athens, and we were supposed to leave on Monday (as we had to be at work on Tuesday). Can you guess? Monday WAS Labor Day. Which is celebrated in Greece too, so traffic was… well, it gave Bucharest a good run for the money. We did manage to make it out of the city eventually, but it was late, we were already a bit cranky and annoyed. It took longer to drive back home, about 27 hours, but in the end it was all worth it. I’d come to Athens on a whim, with a small twinge in my heart. 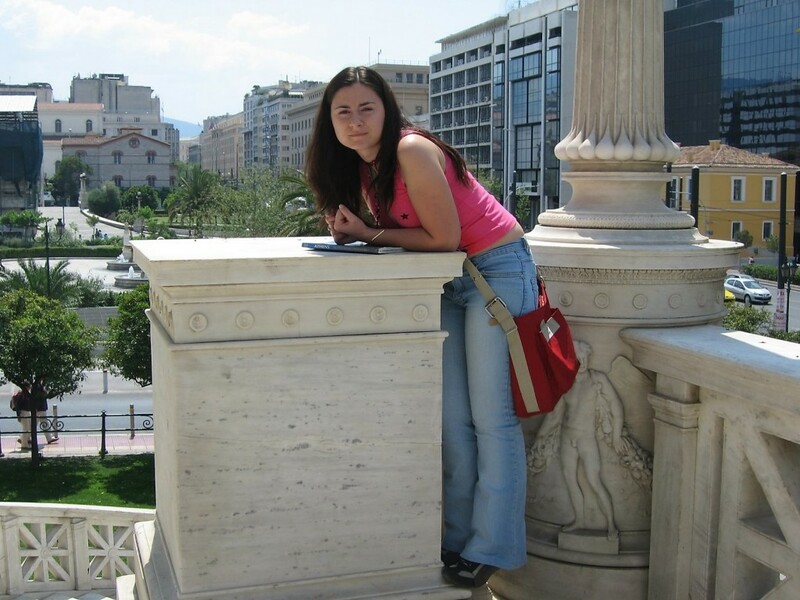 See, I’d had friends (one of them was at the time studying to become an architect) visit Athens before me. Their reaction was good, but more in the lines of “meh.” They’d found it boring to see old rock after old rock. 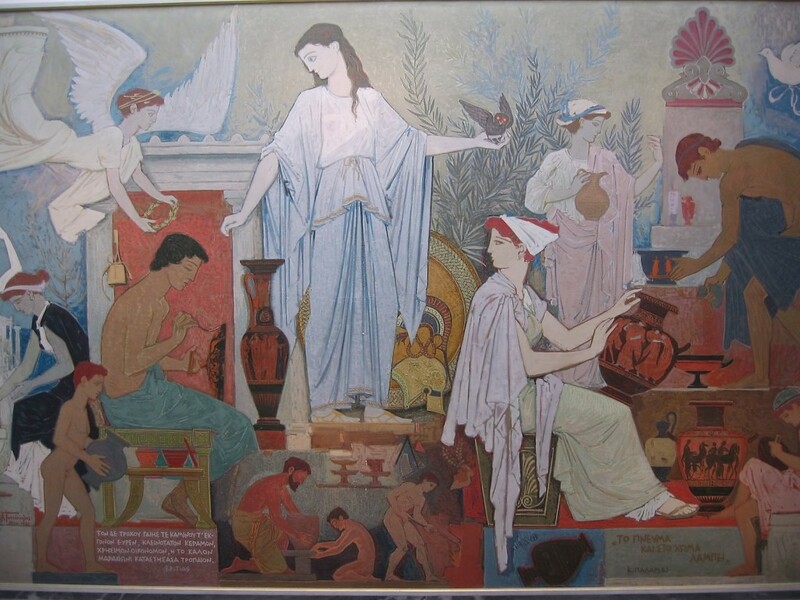 Plus, a life time of hype about how gorgeous Athens was, and all those Greek myths we’d all read growing up made it hard not to feel a bit let down. Last minute getaways are the best you’re right! 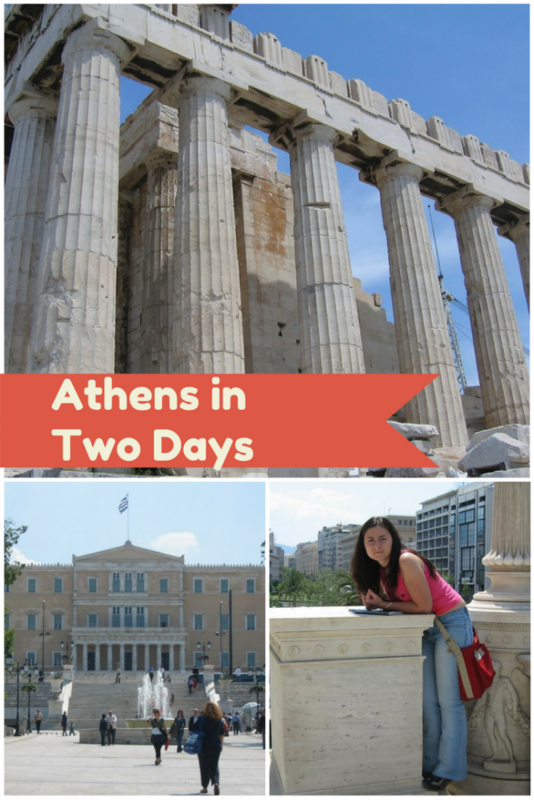 I only spent 48 hours in Athens and honestly wasn’t my favorite in Greece but so much history to behold! I loved it so much! Which is what surprised me 🙂 A lot of people I talked to were w bit meh after their visit. 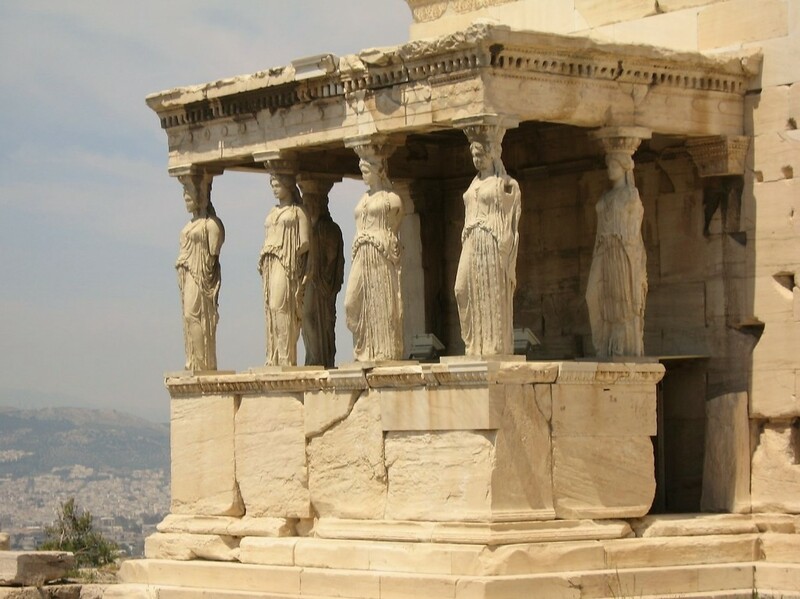 Greece has so much grace and elegance to it…I guess it has to do with the heritage and history. We went several years back, but seeing posts like these makes me feel like going back again. 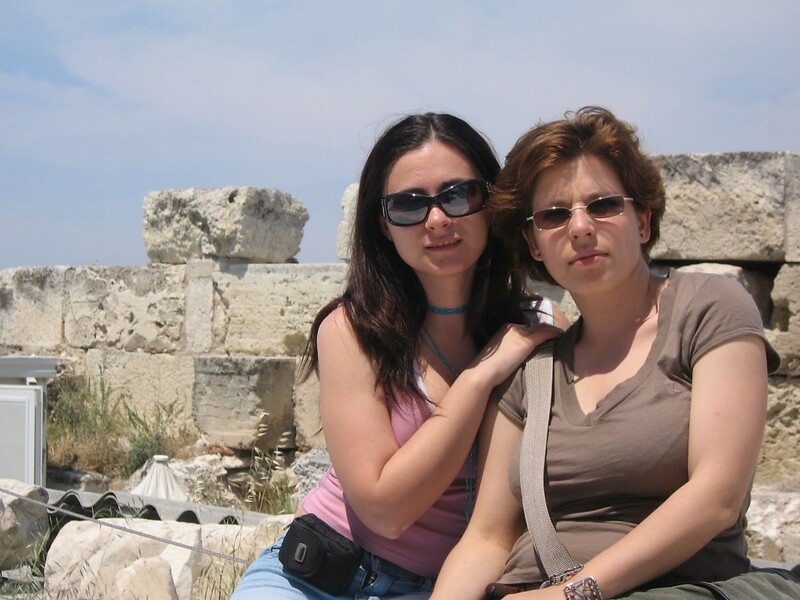 We had the same feeling visiting those ruins of Acropolis and other structures around. The magnificence and grandeur of the structures left an indelible mark on our thoughts. We wished we could see them in their days of glory. I’ve always heard not-great things about Athens (yeah, the traffic too), about how one should see the ruins and then get out of there. Your post somewhat confirms this, but the photos of the ancient sites still make me want to go. Two days is probably a good window. If you were there this year, we both were there =). I have to say that I envy that you can just get a car and reach the greek coast, it’s fantastic. But also, I’ve always wanted to visit this city and I felt like it dissapointed me a lot… it was a mess from day one to day 6…. I’m not sure I’ll ever return. Anyway, I’m happy you had a good time! I love spontaneous trips like this 😀 The best type of travel, really! I’ve never been to Athens and unlike your friends, I think the old ruins would impress me very much. Crazy that you drove all that way, though! I agree, most of the time spontaneous trips are more fun and memorable, plus full of adventures and stories. 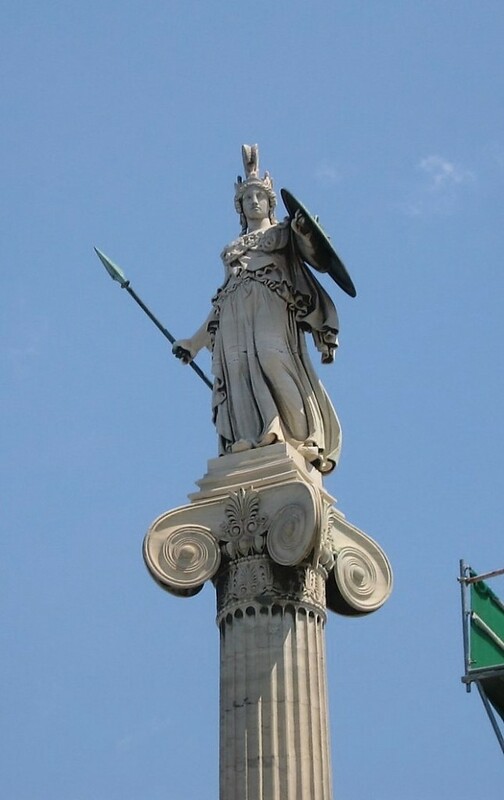 I can’t help but admire your travel photos, especially the Statue of Athena… so powerful. Yeah, I think I’d want to go to Athens mainly for the ruins and the history, and make my trip brief. Despite the talk, Athens still isn’t a place to be missed! You took some great pictures, too! What an amazing scenic drive from Bucharest to Athens – Now that is what you call a day trip! Athens is beautiful, I always had a soft spot for greek mythology. I also love spontaneous trips like that event if I’m used to prepare my trips (maybe ’cause I’m too stressed?). Love your post! Hope I can go to Athens soon! Ah one can only imagine these places during their glory days. They must have been so grand. I also loved that statue you loved at the museum – so quirky! You guys are my kind of people! Love that you guys just hopped in your car and drove over! I wish I lived close enough for that to even be an option. 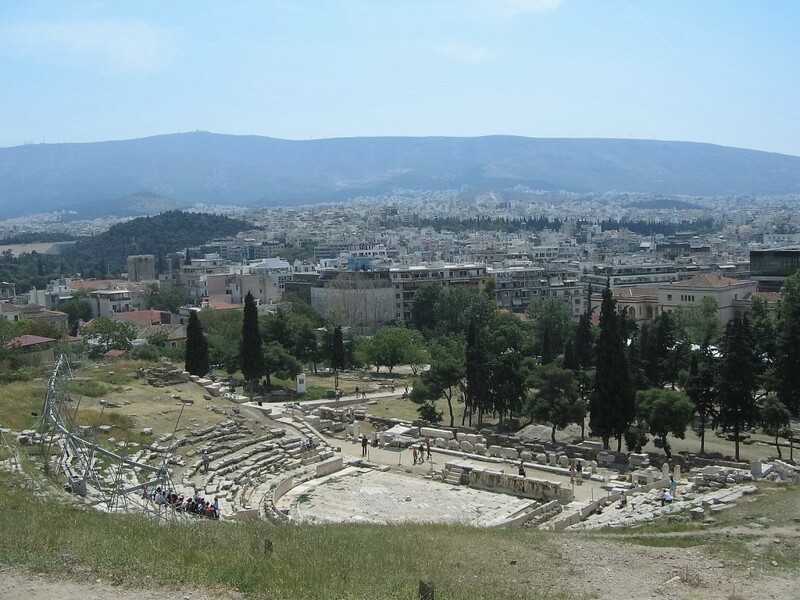 Herodeon view from Acropolis is absolutely breathtaking. I can only wish to be able to see it in 2018! 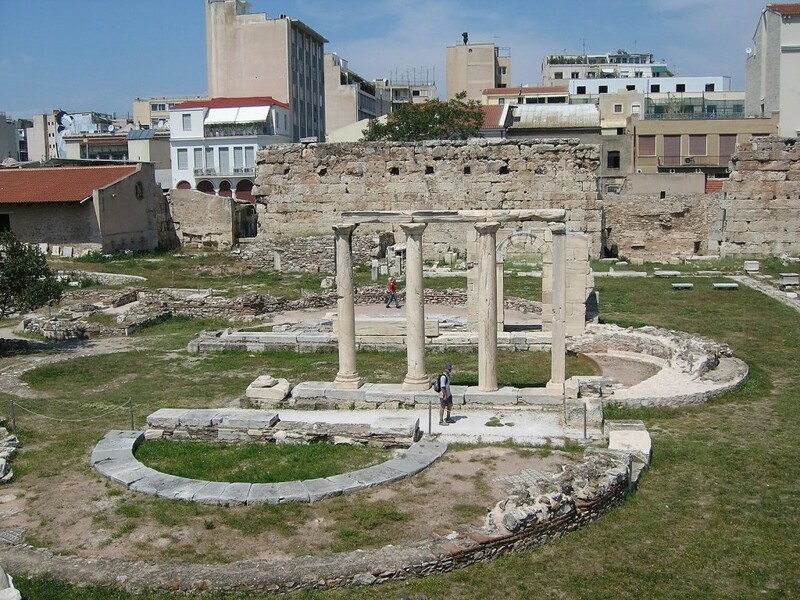 Athens is a must-visit for any heritage lover. I would love to do this one and that perhaps is my top reason of wanting to go to Greece. 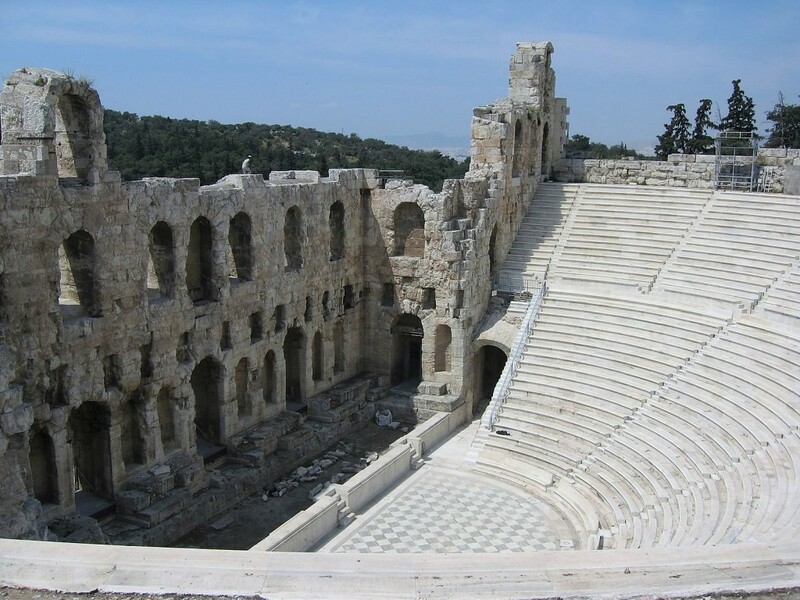 The theater, the museum, Acropolis …..oh Man! I think three days may just not be enough for me. Thanks for sharing this and re-igniting my wanderlust. 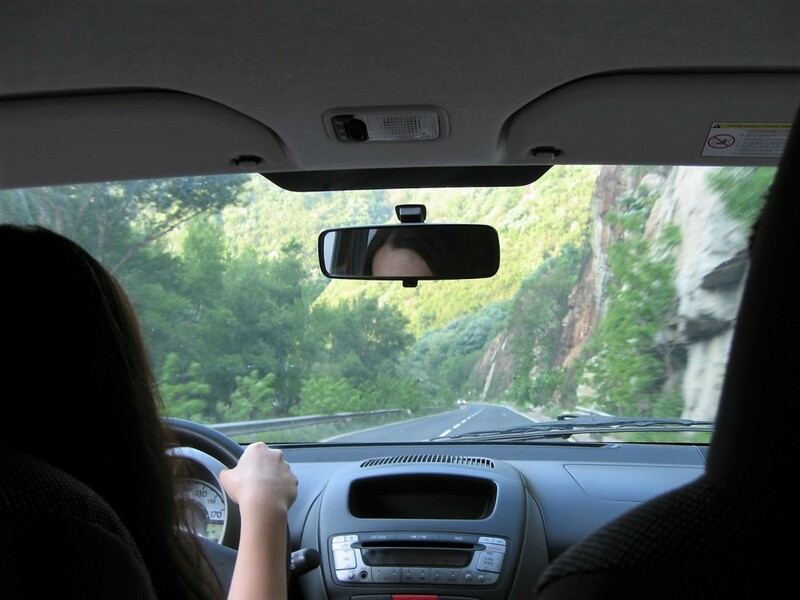 Last minutes getaways are so much fun and look like you had an amazing road trip! Greece is on my bucket list and your pictures make me to plan trip there soon! 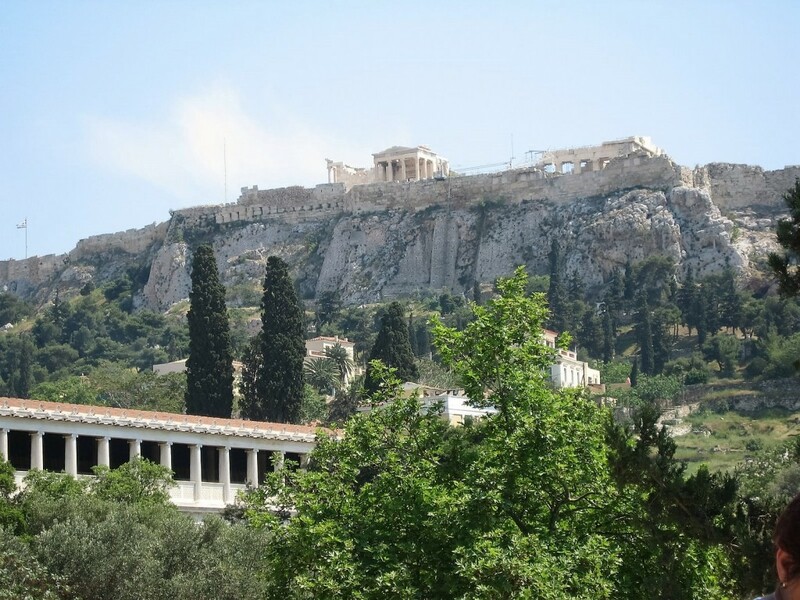 Amazing travel journal – I loved visiting Greece so much. Going through your journey in Athens makes me want to go back so badly! 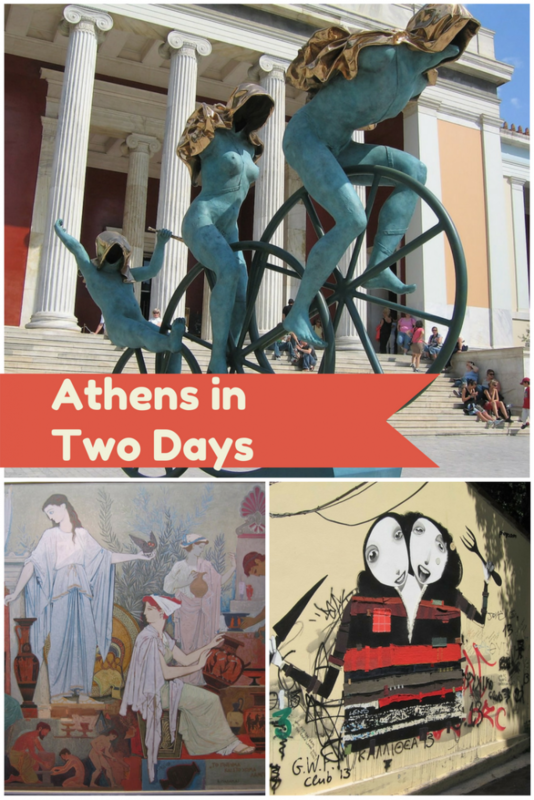 you know I am always on the lookout for posts on Athens..Even more so when the post is written as a travel journal instead of the usual “to-do” guides..Nicely written and the photos are quite good. 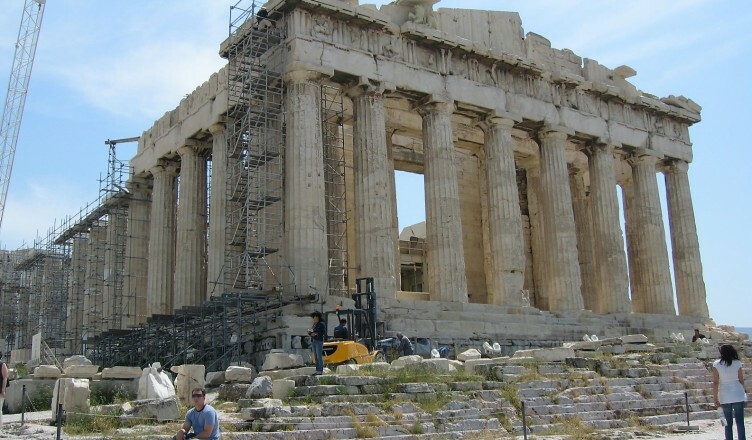 The Acropolis and Pantheon are two of the better attractions of Athens. Wow! How exciting!! 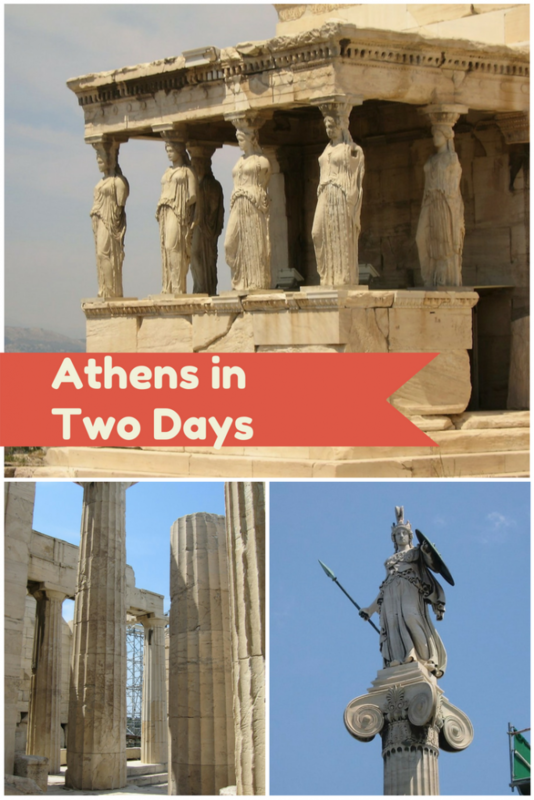 Greece is on our agenda for 2017 and I love reading and seeing photos about what we’ll see! I know there are a LOT of stairs so we always have the kids train for a trip. Lots and lots of walking so they will be in good shape. I know your mom would have loved to get to the top but she no doubt was happy for you that you did!